And that’s when we first went live. A few weeks prior, I learned about a free hosting site with templates and having just attended a basic HTML class, I took a deep breath and dove in.Using Martin’s family scanner – which moved as if made of chilled molasses – I posted pictures and together, we wrote up the story of our courtship and engagement.The motivation was to include our family and friends from around the globe as we planned our wedding in Germany. And to say it grew from there is putting it mildly. We continued the blog as we moved to Italy, became parents, traveled Europe and generally kept friends and family updated on our lives. In 2003, I figured out how to add video files for download – which could take up to 30 minutes for our dedicated readers to open! I also started keeping a “journal” which was different from how I normally posted on the site, which included creating a new page with content and photos for every event I was writing about, such as Trip to the Zoo or Baby’s First Road Trip. The journal was just my thoughts – no photos. It wasn’t until 2005, though, that I started referring to it as my blog. 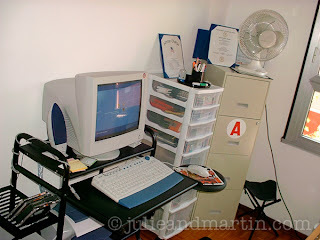 And in 2006, I figured out how to put together photo slideshows for easier upload and viewing. For the first five years, we stayed in our original hosting site. They offered a variety of templates, which I updated every year on our anniversary. In 2007 (or was it late 2006? 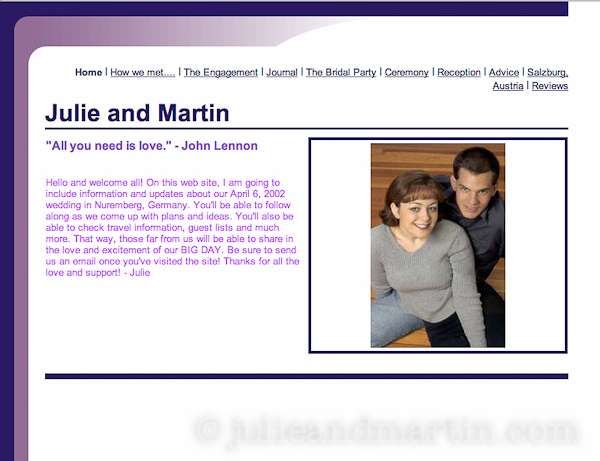 ), another friend told us about another site which was a little more flashy, so we made the switch and purchased the domain, julieandmartin. This made it so much easier for friends and family to look us up and keep in touch. Our site – which we were now paying for – became a lot more streamlined, although Martin and I both had our individual blogs as subdomains: Martin’s Blog and Julie’s Blog. We also experimented with photo albums, chat forums and stat tracking. And people could finally leave comments on our site without emailing us! Our readership grew during this time, too, going beyond just friends and family. When I was deployed, our site got passed around the old-fashioned way – through email – as those faithful family and friends shared our story with their coworkers, church friends, neighbors, etc. We ended up hearing from so many kind-hearted strangers, many sharing their own military memories or offering up words of encouragement and advice. Our journal page during the fourth year site from 2005-2006. It was the first time we really experienced the power of blogging and sharing our story with others. So we stuck with the new hosting site during my deployment, although I just never did get the hang of their interface. Though the site is known for it’s outrageous SuperBowl commercials, I just didn’t fall in love. It was a pain to update and I spent a lot of time on the phone with their customer service line, which wasn’t toll-free, by the way. Keeping up a blog/family web site is hard work as it is: the actual logistics of maintaining it shouldn’t be complicated or require a lot of tech-y expertise, in my humble opinion. So I started looking elsewhere. It wasn’t until 2009 that I decided to go with blogger.com, even though we lost all our old comments and forums. But we’ve more than made up for it. We combined all our past sites and the blogs into one archive. And we loved how easy it is to network with other blogs and have access to all our media accounts, too. However, sites changed and when Google acquired Blogger, it seemed like the blogging platform came to a screeching halt in regards to updated templates and interfaces. So, now we’re using WordPress. The site’s appearance and navigation may change, but the content is, and always will be, the same. And so that’s where we are today!